Museeuw Bikes flax-carbon racing bikes are now available in the US. Founded in Belgium by the classics great Johan Museeuw, Museeuw Bikes is the first bicycle manufacturer to use revolutionary flax-carbon composites. The new patented material adds shock absorption to the stiffness, strength and lightness of high performance composite frames. Who better than the "Lion of Flanders", former World Champion and three-time winner of the Paris-Roubaix race over cobblestones, to create uniquely comfortable ultra high performance racing bicycles? Museeuw Bikes will be exclusively distributed in the US by Velocon Sports of Concord, Massachusetts. Two models of the Museeuw range will be stocked for the US market, the MF-1 and the MF-5. A track frame, the MF-3 Pista, and a cyclocross frame, the MF-3 Cross, will be available on special order. The MF-1 model is handcrafted in Europe from tubes with 40-50% flax fiber and the rest 3K HM carbon fiber, while the MF-5 model comprises 80% flax fiber and 20% 3K HM carbon fiber. Both models have 100% 3K HM carbon fiber lugs and 50% flax, 50% HM carbon fiber forks. 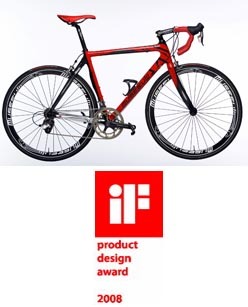 Museeuw Bikes has been honored by the European industrial community with a prestigious iF Product Design Award for 2008. The Museeuw Bikes MF range of frames won first prize in product design over nearly 3000 other entrants from 35 nations. www.ifdesign.de. Velocon Sports represents the very best in high-end cycling equipment - the kind of products that only the most knowledgeable and capable retailers offer to their customers. Our business is run by a team experienced in retailing quality European road bikes. Technical innovation, production quality and reliability of supply are the essential criteria we use in product selection. We are proud to distribute and support Museeuw Bikes in the USA.